Can the patient hear music when under anesthesia? This is a questions that many people misunderstand. There are many different ways that people perceive music, and hearing is but one of those ways. Music creates vibrations and the human body is very sensitive to vibration. You can easily test this out by donning some noise-canceling headphones, or even put your hands tightly over your ears, than walk up to your TV or some speakers that are nearby. You may not hear the music, but you will feel the vibrations coming from the source of the music and the pulse of the rhythm. THAT allows for the power of the rhythmic music to entrainment. For many years, patients and physicians both have believed that music could not be heard when under general anesthesia. Because of this, most physicians did not consider playing music for the patient, and the patient did not consider asking for it. A prominent exception to this was Dr. Kenton Leatherman, here in Louisville, KY, who realized in the early 1950’s how benficial beautiful music in the OR could be for patients. Dr. Leatherman told me that he actually paid a woman to play light classical and folk music on a record player in the corner of the OR. This was the day of 78 RPM records so she was turning over or changing a record every few minutes. Dr. Leatherman was famous for his lengthy and arduous surgeries and he related to me that he felt the music helped to keep his energy level up, as well as keeping the patient calm and relaxed with excessive anesthesia. 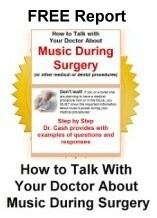 So if you are planning for a surgery or medical procedure like an endoscopy, colonoscopy or cataract surgery, please either choose some slow, soothing, steady music to bring in on your iPhone or iPod, or get some of the Surgical Serenity Solutions pre-loaded, cordless headphones for surgery! To purchase, click HERE! Really?? Music DURING Surgery? Yes! !